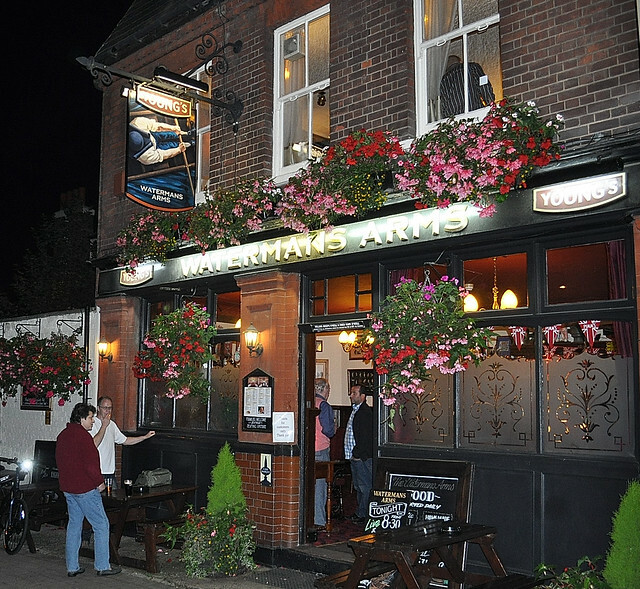 The famous Monday Night Music Club at the Watermans Arms, Richmond began in 1998. 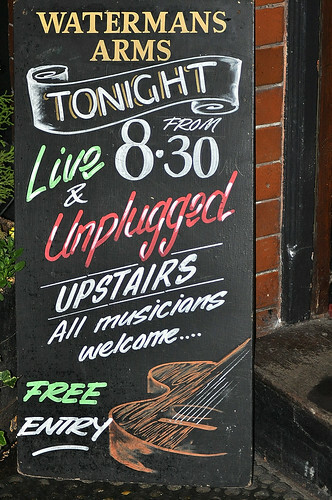 It was started by Mac McGann and Alan Young and has for many years offered an eclectic mix of folk, blues, rock, indie, poetry, comedy and more. Mac and Alan created a very special atmosphere drawing in established performers and encouraging many new ones with their warmth, generosity, musical skill and, above all, humour. The club continues to this day and from 2005 has been hosted by Sebastian Stride. Brilliant blog/site – it’s great seeing everyone on here!!!!!!!! …….. much more to come I hope – there must be loads of good stuff out there! Great to see Mac’s original poster! Where did you find the poster Tony? I remember it very well. Fritz the cat in the Waterman’s Arms. I assume this is still running? Also can 17 year olds perform ? We’re still going strong. Every Monday 8.30pm – 11.30pm. No age restrictions. All are welcome. Hope you can make it sometime. We are here every Monday. (8.30 – 11.30). Usually each performer gets three songs. It’s totally unplugged. No need to register. Last Open Mic of 2014 is on New Years Eve. 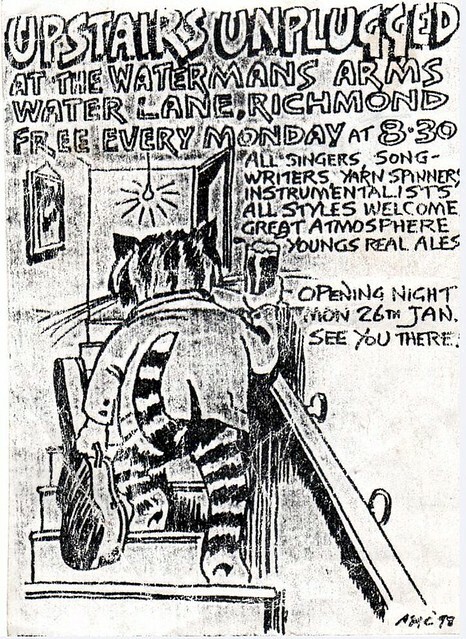 The regular Monday night spot resumes on January 5th 2015.
is there any possibility of a keyboard/piano being there? Unfortunately we haven’t got an in house piano. Occasionally performers do bring their own keyboards. Hope to see you soon. Does anybody know if there is an age requirement for attending the open mic nights and possibly performing in them? I’m a singer songwriter who just finished school but I’m not 18 yet. If anyone knows that would be great. No age limit. The youngest performer was 10 years old. Looking forward to hearing you play. No problem. All welcome. Hope to see you on Monday. Here’s a video I made at The Music night in 1998 I dont know the musicians full name if anyone can help me with it please Stuart seems to be his first name ? Certainly. You will be the second belly dancer to perform at The Watermans. Gutted to hear the Monday Club is no more. Hope it finds a new home soon. Great news. 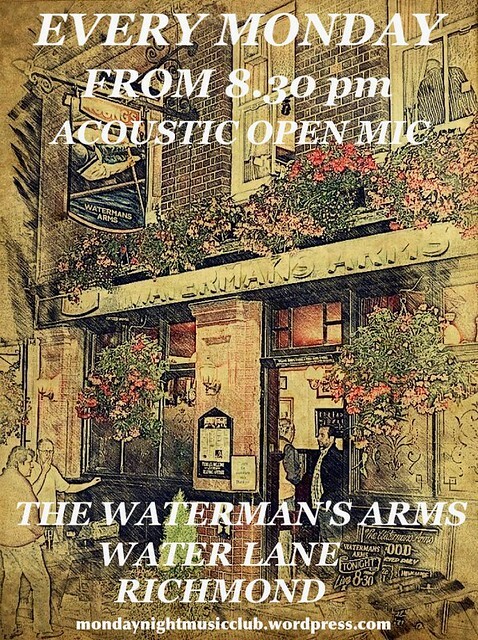 The Monday Night Open Mike Night at The Watermans Arms will be up and running on Monday the 2nd January 2017 from 8-00 PM. Don’t be late. Vic. Please confirm that open mike Jan 2nd 2017 is on. The barman Had no knowledge of this when I passed by on 23rd Dec. I am not a performer but always found the open Mike at the arms to be of the very highest standard. Open Mic on January 2nd 2017 CONFIRMED. as an avid listener thanks to all of you wonderful performers, perhaps someday I will pluck up the courage to join your ranks. Sadly I’m going to miss the next couple of months but hope you are able to keep the neighbours at bay for my return.